Steven Carl Smith. 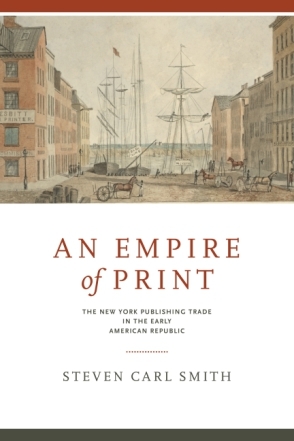 An Empire of Print: The New York Publishing Trade in the Early American Republic. University Park, PA: Pennsylvania State University Press, 2017. xvi, 244p. ISBN 9780271078519. US$ 99.95 (hardcover). It has been roughly 35 years since Benedict Anderson posited a connection between “print culture” and the “imagined community” of American nationhood. In the meantime, this relationship between things material (print) and things imagined (nation) has, somewhat paradoxically, become both a widely-held assumption and an incredibly difficult connection to measure and prove. How do we know “nation” when we can’t see it, except for what we can see of its smaller, material parts? Landmark scholarly works on print culture in the early Republic such as Michael Warner’s Letters of the Republic (1990) and Trish Loughran’s Republic in Print (2007) have made considerable waves in the discipline with their varying accounts not only of how, but also when print created and shaped a national community.